The most difficult part of the trip is always the drive back. The hours crawl by on the way to catch the ferry when you leave home at the start. Cruising along at the speed limit for trucks is an exercise in patience when spirits are high in anticipation of the coming adventure. In the opposite direction, when the daily routine awaits, the road requires even more discipline. The solitude of the highway in the wee hours is quickly dispelled in the dusky orange and turquoise hues of morning twilight. It almost doesn’t seem possible that the same sun also rises over the silent, empty sea of dunes that stretches from horizon to horizon. The news on the radio brings you sharply back into the world that is yours but which you only temporarily left behind. A week ago when we stopped at dark to make camp in the Oued Rheris, we were in a different world. The labyrinth of scrub trees that effectively stymied us after nightfall proved much less difficult with a visual point of reference that came with the golden light of morning. A short walk was all it took to find fresh tracks leading through and out of the dense shrubs. It almost didn’t seem possible that we had missed them in the dark. On further inspection, we realized that we had been only 20m away when we had turned around thinking we had reached a dead end. In any case, the tracks that were obvious by day may have been difficult to make out by night while navigating primarily by instrument and with little input concerning the actual state of the surrounding terrain. That method only works well when you don’t have any obstacles like trees, rocks or holes. 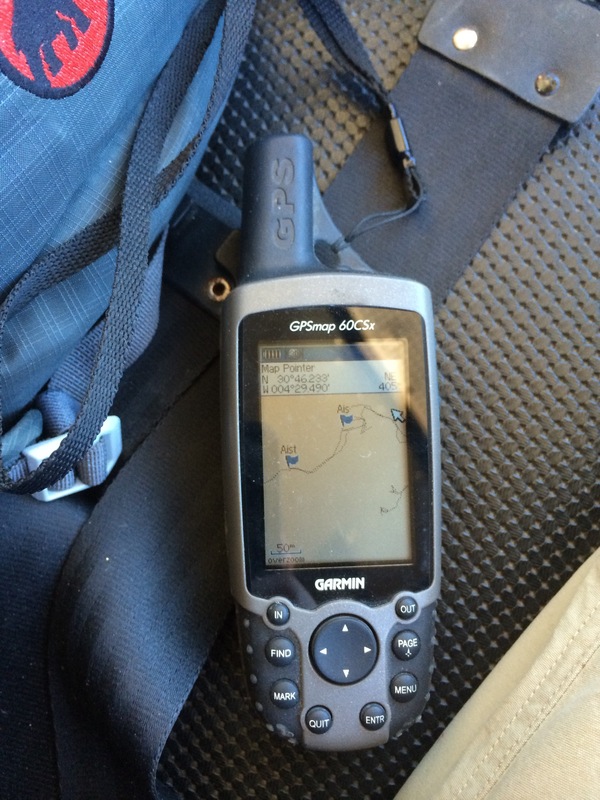 We used the handheld GPS again to save time finding our way out of the trees. When we were back on our way, it didn’t take long to reach Foum Mharech, where we stopped for tea on the terrace of the Riad Nomad with its elegant hedge of Oleander overlooking the immense valley below. 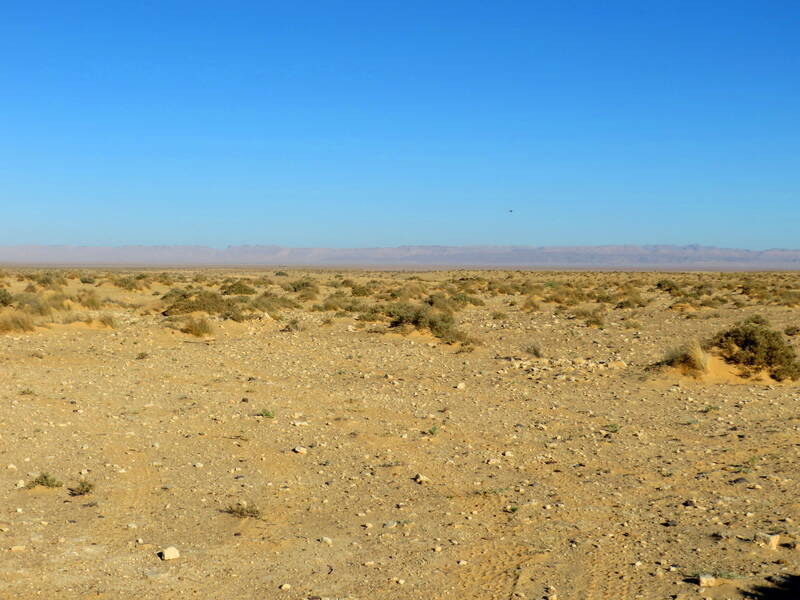 Continuing our way to Zagora, we stopped in the plain to take a photo. Our hope was to get the same shot as in 2012, but we decided to avoid the middle part of the passage, which seemed to be soft from the recent rains. Getting stuck in the mud wasn’t in our plans for the day. 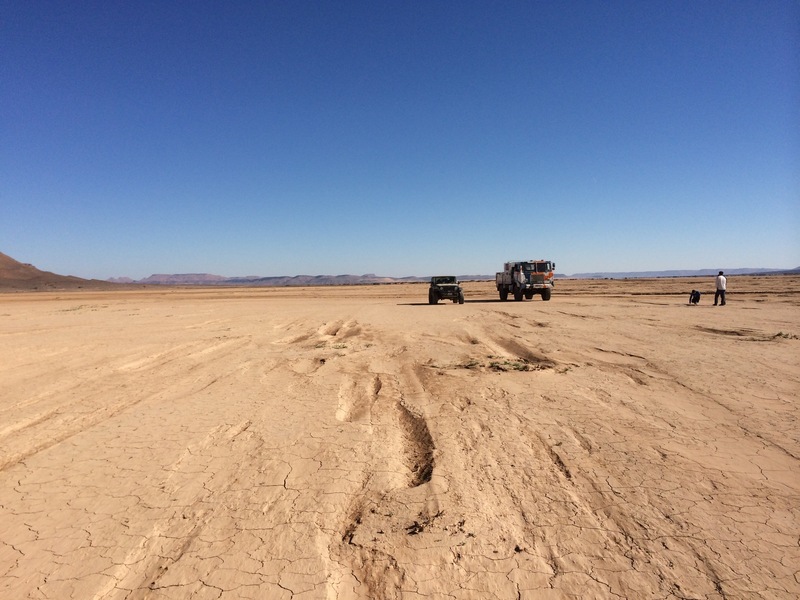 Two years before, the Foum had been a dry, barren plain where the track had been fast as long as you kept a lookout out for the larger bumps and ruts. This year, we had to make our way more carefully. We were amazed to see a few worked patches of soil that soon gave way to field after field, freshly tilled and ready for sowing wheat. The dry barren plain had been transformed by the rain into fertile farmland! We drove west toward Zagora, continuing on the narrow piste that at times closely hugged the base of the mountains to avoid ravaging the carefully prepared fields. At Tafraoute du Sud, some locals came over to meet us. The crossing was not practicable they said, offering to lead us across over a “sure way.” A tractor about 50 meters away was heading over, we replied that if he could cross, we were sure we could too. Turning into the soft sand, we were hindered by all the children running beside and zig-zagging in front of us as we picked our way across. Some of them were very small and hard to see from inside the truck. We were afraid they might get hurt. Once we were safely on the other side, we decided to stop for lunch at the auberge. Under a clear blue sky we shared the most delicious omelette Berbère in a setting as stunning as a tropical paradise in any tourist brochure. We talked a little with some locals and gave a man a lift to a nearby village in exchange for guiding us through the passable section of a muddy riverbed farther west. Several other tourists in 4×4’s took advantage of the opportunity to follow us through. The rest of the afternoon was uneventful. 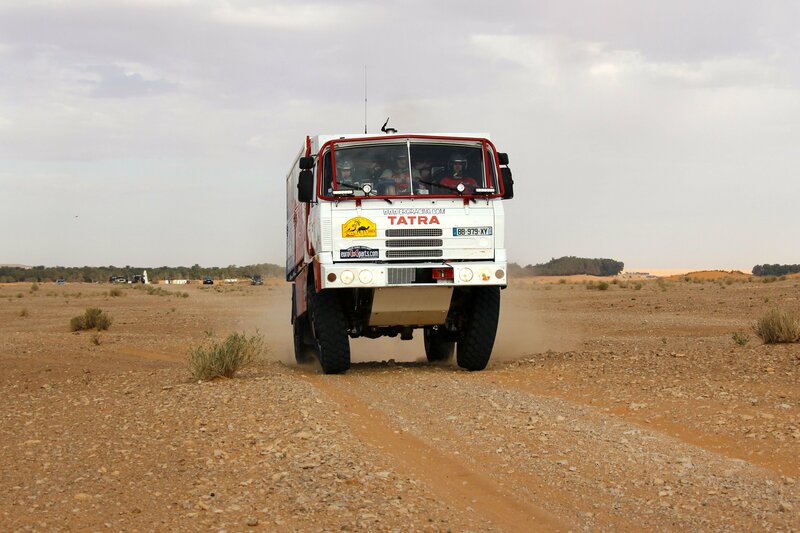 We arrived in Zagora by the wide well-leveled piste through the Tizi-n-Tafilalet. At the entrance to town, we checked into the Hotel Sirocco where we spent the night before heading over to Ali Racing the next morning for a check-over. 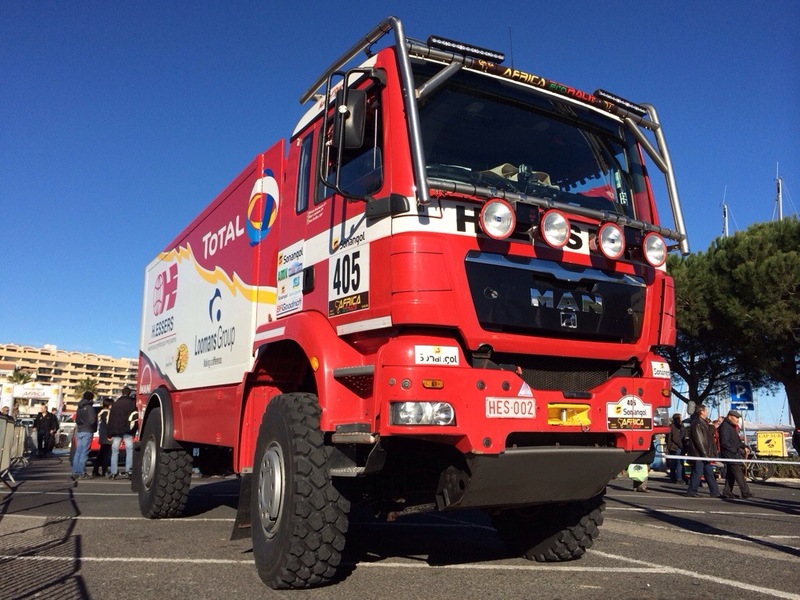 We hadn’t had any mechanical problems, but we thought it was worth a look after three hard days off-road. It’s easy to lose your sense of time on the piste, and difficult to find time to write. Check the ErgRacing Twitter feed in the right hand side-bar for the latest updates via Wifi or SMS. 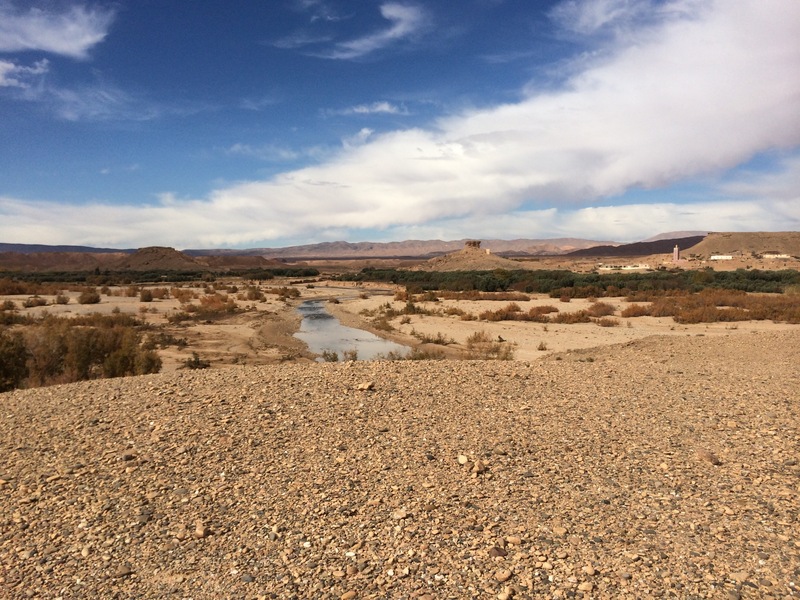 On Christmas morning, we were up to see the sun rising over the riverbed in a deep blue Moroccan sky. The warmth of the golden rays quickly dispelled the humidity that had settled during the night. Eager to head out, we took breakfast and broke camp quickly. The track we had chosen was varied. Within 30 minutes we had to navigate through a small swath of dunes. Later, we got a good taste of mud at a river crossing. 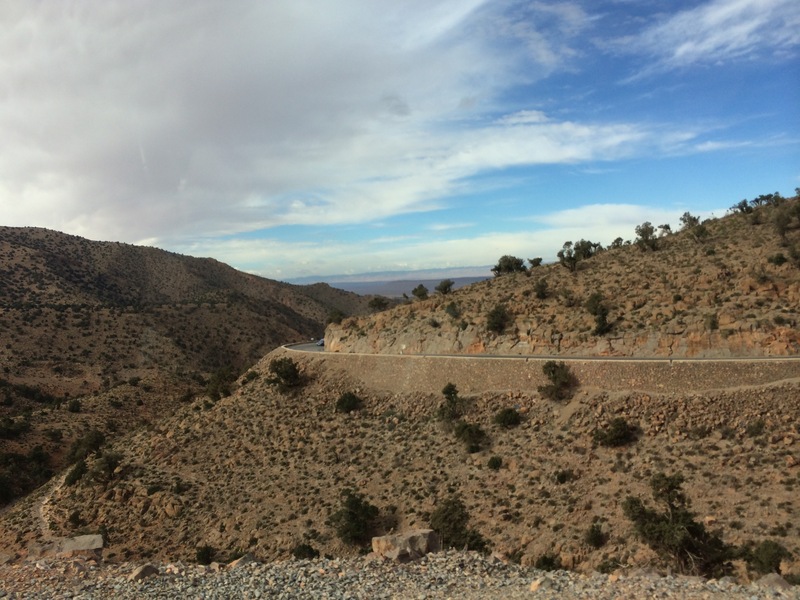 We picked up part of the trail from the 2012 Rallye du Maroc along the cliffs, and through a narrow rocky pass. The steep winding piste had been thrilling but easy in the Jeep. The descent in the truck took significantly more skill, not to mention nerves of steel. We managed to pick up and follow part of the rallye roadbook to the oasis where we had picnicked two years ago. The area had recently been flooded and the ground was still soft and muddy. The well where we had drawn water was filled with sand, and we could see they had since installed a pump. Later we learned from the locals that the drought had been severe for two years. The wells had dried up and they had dug deep in search of water. We took rooms with board at the Hotel Touareg, which has been renovated since our first visit in 2010. The rooms were comfortable, and it’s nice to wash away the sand under a warm shower and catch up on the news in the rest of the world via Wifi, but sometimes the simple comforts of the bivouac are just as enjoyable. 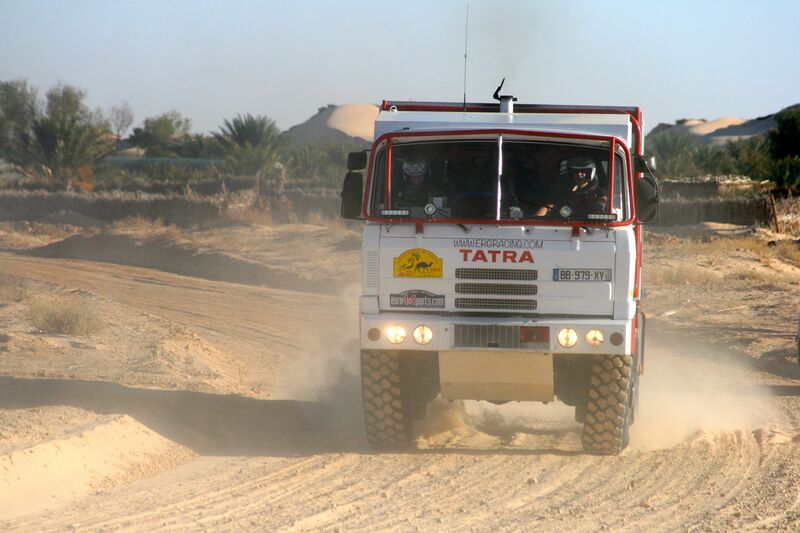 On Friday morning, we took the Scania for a short spin in the big dunes. After so much rain, the sand was hard and carried well. We didn’t have any trouble crossing some of the steep dunes near the edge of the Erg Chebi. Afterwards, we went to a nearby lake where we had been told we could see some pink flamingos. We observed a solitary representative of the flock we had been expecting, although we took some nice photos of the lake with the dunes as a backdrop. Look for them when we publish our photo gallery at the end of the trip. By early afternoon, we headed south to Taouz, where we planned to pick up the piste to Zagora. 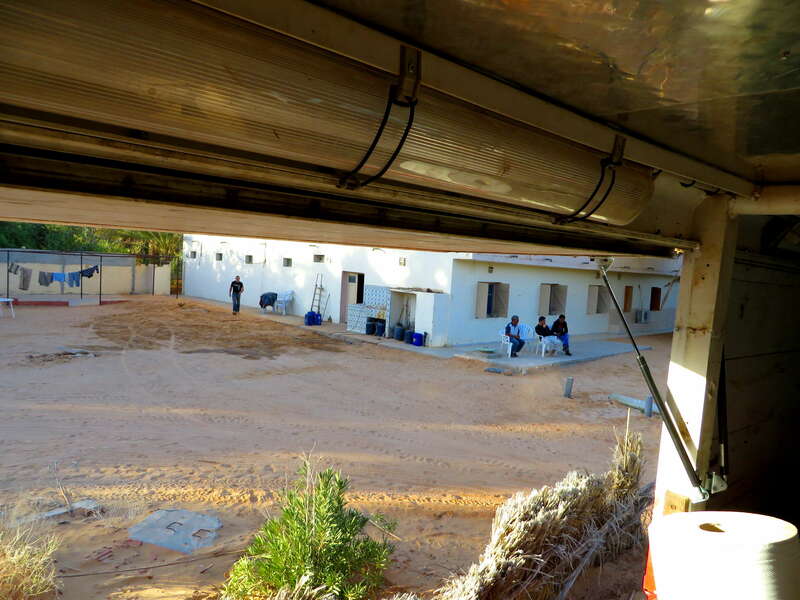 We were anxious to return to Foun Mharech and stay the night at the Auberge Riad Nomad, if possible. On the outskirts of town, some local teenagers had gathered at the turn-off to the piste. They told us that the flooding had modified the tracks and that we wouldn’t be able to cross the river in the south, trying to convince us to go another way or take a guide since we “might get lost.” We thanked them for the information about the condition of the route, but explained that this was not our first time overlanding in this part of Morocco. We were not alone as we started on our way. Three Belgian MAN camper trucks had also set off along the same route. We stopped to picnic when we thought we were far enough from town to avoid been solicited, but a peddler passing on his mobilette arrived while we were eating and set up all his wares. He didn’t get any reward for his effort. By early afternoon we were underway again but making slower progress than expected. We decided to take a shortcut and ended up on a dead-end piste in the mountains. Fortunately, we had a good vantage point to study the tracks in the valley below. With a little ingenuity, we managed to go down into a small ravine and follow the riverbed for about a kilometer to pick up the track again. We lost time, but we had come for the challenge. If we hadn’t found our way and had been forced to double-back, we probably wouldn’t have been as proud of ourselves. Having taken the northern pass where we had been told we would be able to cross the river, we thought the worst was behind us. Then about 25 km from Foum Mharech we came to an intersection. One piste continued straight while the other turned south. Arrows indicated Foum Mharech in several directions. We didn’t want to tempt fate by going too far south, so we took the piste toward the west. The track crossed two oueds, one after the other. Daylight was fading, and the traces disappeared as we came to the first Oued and realized the extent of the flood. We picked up tracks again in the broad riverbed, one set seemed to lead south in the direction the water had flowed and the other west. The southern track looked better and we followed it for a little way hoping it would lead us to a good place to cross. After a while, with no obvious signs of crossing, we decided to double-back, worried that the fresh tracks would lead us too far south. We turned west, but after a few hundred meters the traces of the track disappeared again. We decided to find our own way across as quickly as possible. 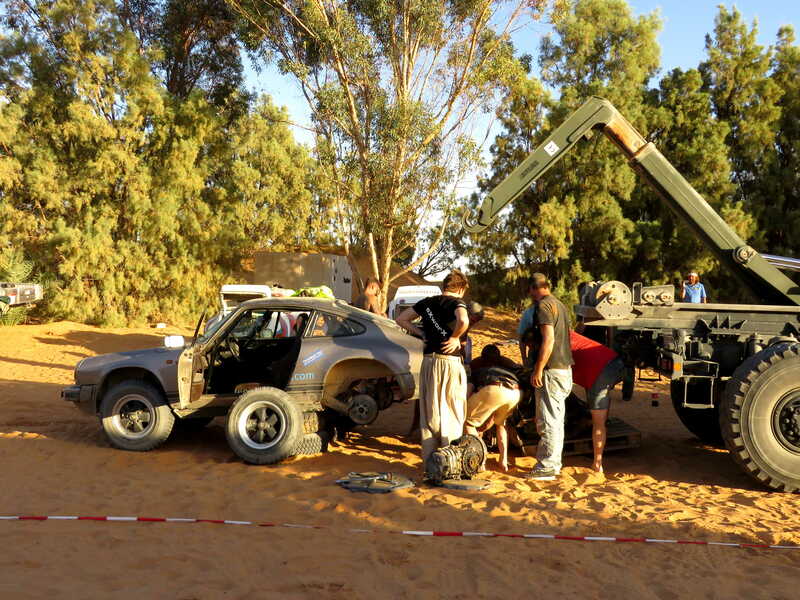 The sun was setting and we wanted to be on safer ground to drive the last kilometers to Foum Mharech at night. We didn’t have much trouble finding a good crossing point, but as we headed west in the fading light, we realized the second crossing would be harder. It was quite dark when we came to a line of trees growing along the river bank, which rose abruptly from the riverbed several meters below. It was too dark to find a crossing point in the truck. We thought of making camp for the night, but the Auberge was not much farther than 14 km away. After crossing, the route would be straightforward. 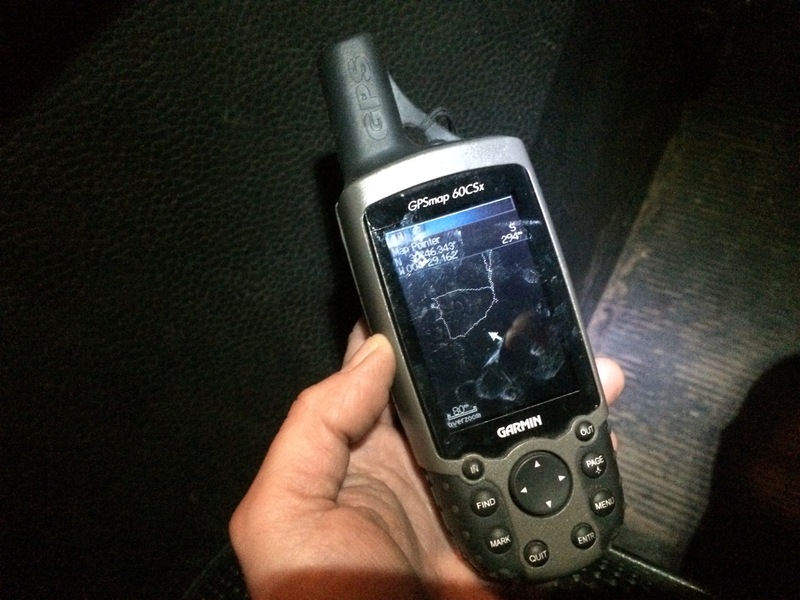 We took the handheld GPS and went to scout by foot. After a while we found a good place to cross where the bank wasn’t as steep. Following the recorded track in the truck, we easily made our way down into the riverbed. The ground proved too soft to make it out the other side, however, so we drove upstream through the scrub in search of a passage. We soon found ourselves in a thicket and it was almost impossible to find our way out of the labyrinth in the dark. We made camp in a small clearing, where the ground was relatively flat. A few lights flickered in the valley not too far away, and we wondered if the Belgian group had also stopped nearby for the night. 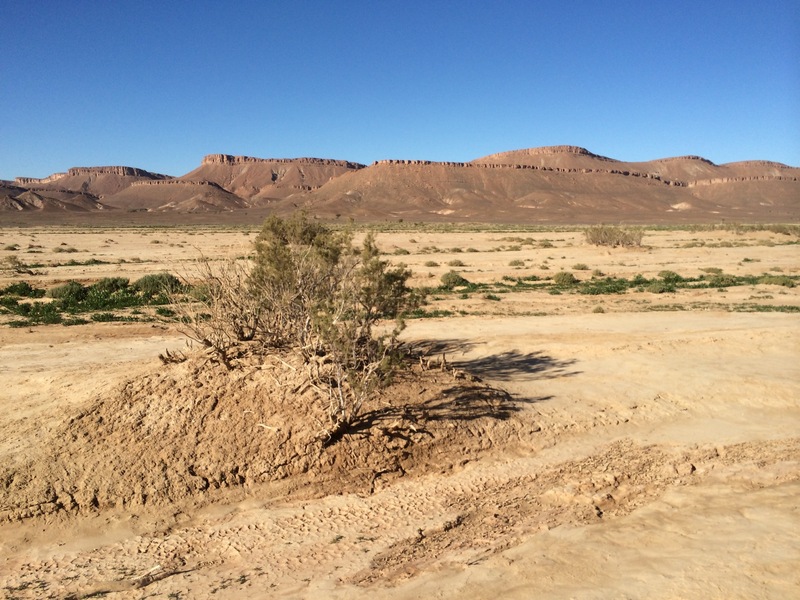 Although we were in the riverbed, the air seemed less damp than at our first bivouac on the plain to the north of Merzouga. We found enough dead branches to keep warm around the campfire. Finding our way out of the thicket would be easier by daylight. We arrived in Merzouga yesterday evening after a fabulous but long day of piste. Using the Wifi at the Hotel Toureg to upload this post. In general posts will be a day or two behind. The ferry arrived on Tuesday in Nador under the wane sunshine of mid-afternoon. The formalities took longer than expected at the port because the authorities wanted to examine the Scania. We had hoped to make it to Missour around nightfall, but we decided to settle for Guercif. It was already quite dark when we passed Hassi Berkane, and we drove carefully the last hour since there are often surprises on the road at night. Pedestrians, bicycles, sheep, branches, rocks: we saw all of these in time. We stayed the night at the Atlas Hotel in Gercif, a simple hotel, clean and comfortable at a very correct price. Dinner at the restaurant was ok, but the breakfast was fabulous. Coffee and warm milk, a large glass of sweet fresh orange juice, an enormous pain au chocolat, cheese spread and strawberry jam: 2.25€ per person, less than the price of a coffee in most major European cities. We got a rather late start, after picking up bread and cookies at the local bakery. From Guercif, we headed south to Missour, through the Gorges of the Ziz in the Tafilalet to Errachidia, stopping for a late lunch at the gas station just after Rich. The tajine was delicious, but they didn’t have much left after the midday rush, so we ordered some brochettes as well. At Errachidia we stopped at the supermarket for some last minute supplies. Not far south of town we turned onto the piste, driving carefully until we found a nice place for a Christmas Eve bivouac. The warmth of the company made up for the inefficiency of the anemic campfire. Hoping our readers had a wonderful Christmas too. 2014 was a tough year. The blog has been dormant due to a number of setbacks that also prevented us from taking the wheel in any rallies. If all goes well, we’ll try to be back in the line-up by next spring. 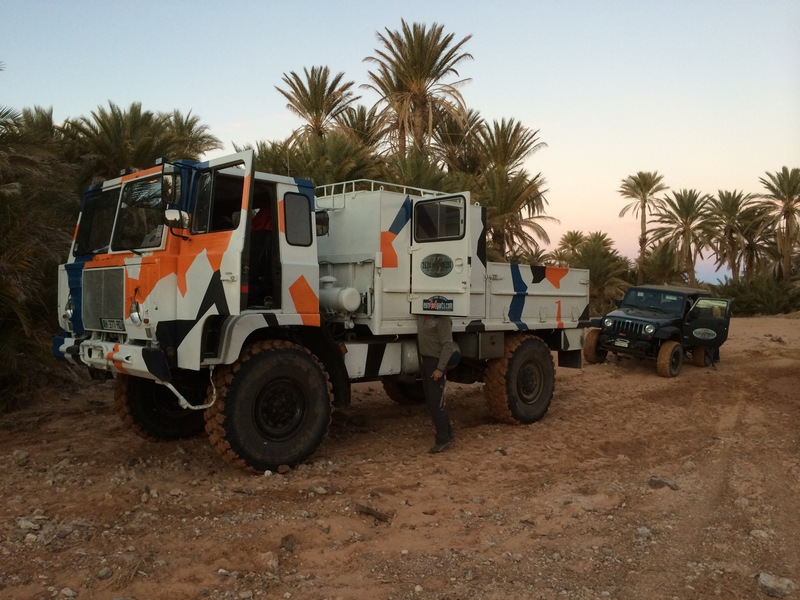 Meanwhile, despite all odds, we managed to get away for some overlanding with the Scania in Morocco during the Christmas break. We didn’t have a lot of time to plan, and we don’t have a fixed itinerary. The main objective is to revisit some of the beautiful places we discovered during our trip in 2012. 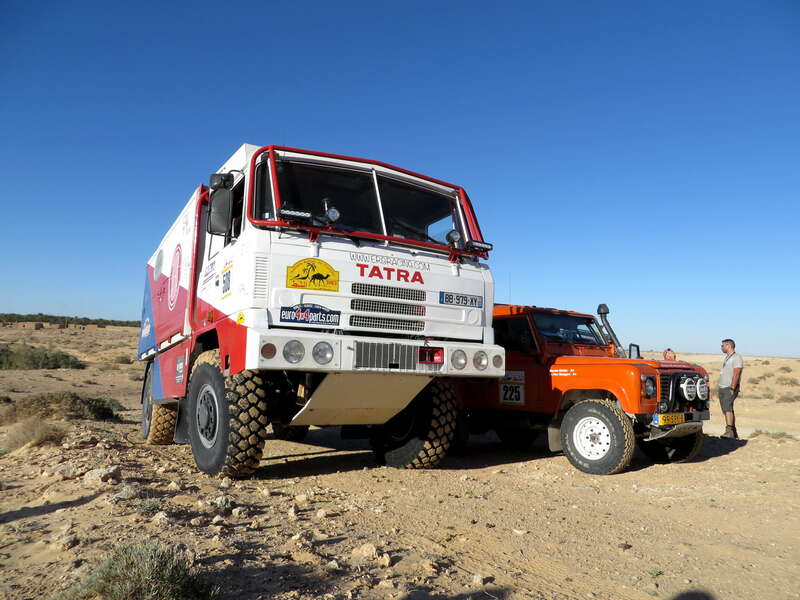 With luck, we’ll be able to catch up with the Africa Eco Race at the end of stage 1 near Errachidia. It feels great to be back off-roading, and we’re looking forward to catching up with friends. If the network connection permits we’ll be posting updates here in as near real-time as possible. Wishing peace for our readers during this holiday season. Some big changes (a new job in a new location) kept us from spending our holidays on the pistes of Northern Africa this year. It was just as well. It wouldn’t have been any fun shivering in the tent with pneumonia. 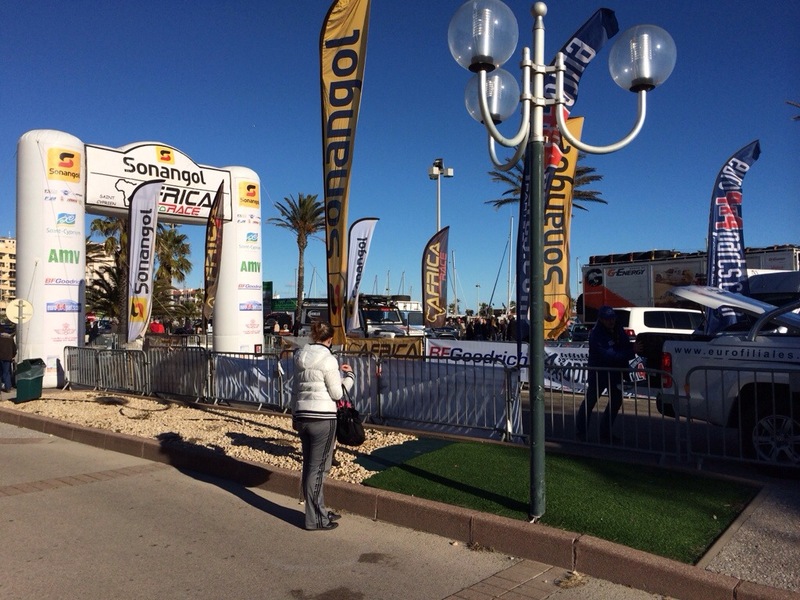 Despite everything, we made it to Saint Cyprien on Sunday, where we spent the day at the scrutineering for the Africa Eco Race. 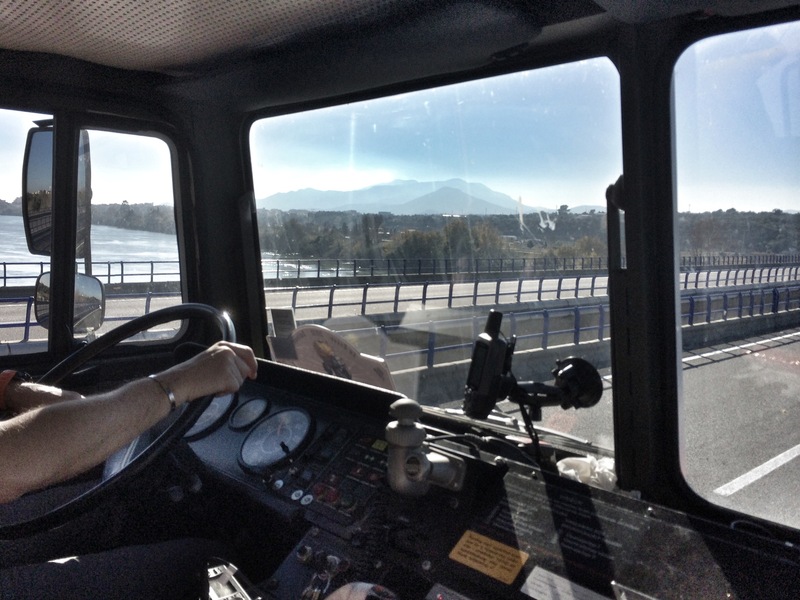 We were glad to have the chance to see so many friends and familiar faces, but we forgot the camera so all the photos were taken with the iPhone, and we decided just to concentrate on the trucks. 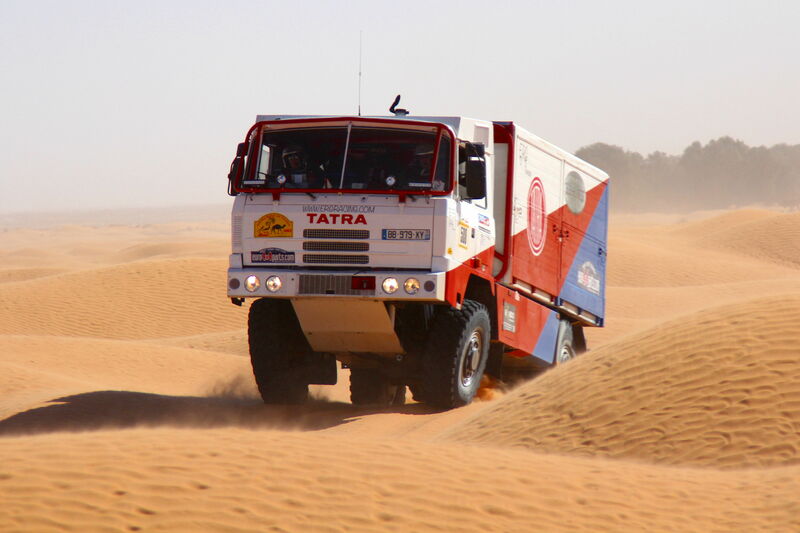 This year’s competitors are mostly returning veterans, such as two-time champions in the truck category, Tomáš Tomeček and Vojtech Moravek, in their Tatra 815. 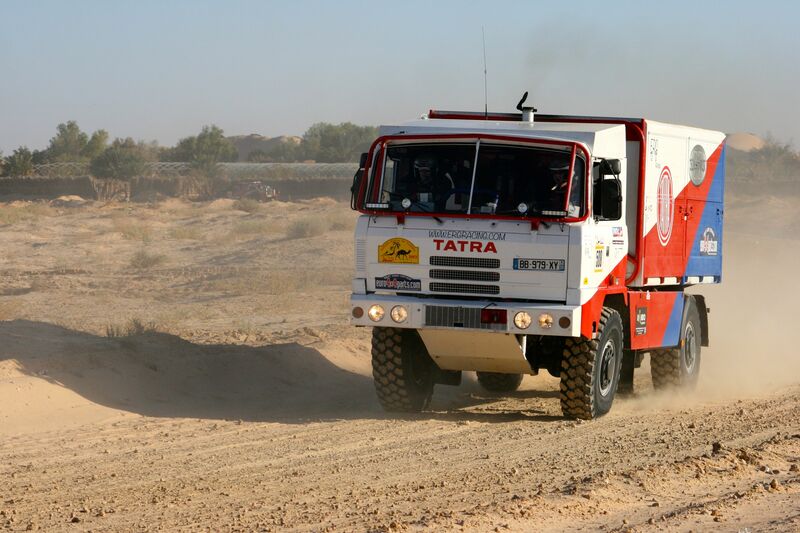 Consistently one of the top Tatra teams on the rally-raid circuit, their truck has the distinction of being “fully powered by Tatra.” They’re also the only two-man team in truck category. 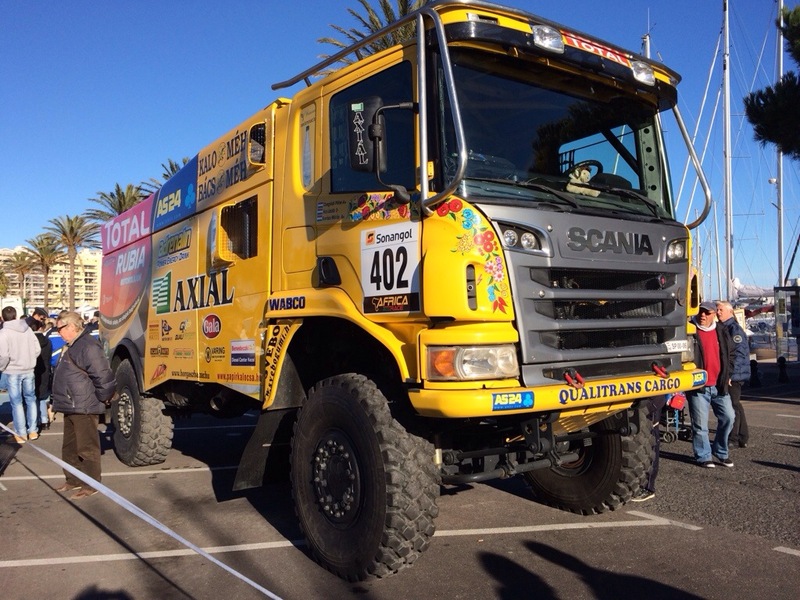 Also back for this year’s race is Hungarian Miklos Kovacs, with his Scania. It looks like he’s made a few modifications to the truck since last year, but it’s hard to know exactly what since we didn’t get a good look at the interior until now. It seems he may have modified the airflow for the two intercoolers. is joined by Gregoor Bouwens this year. 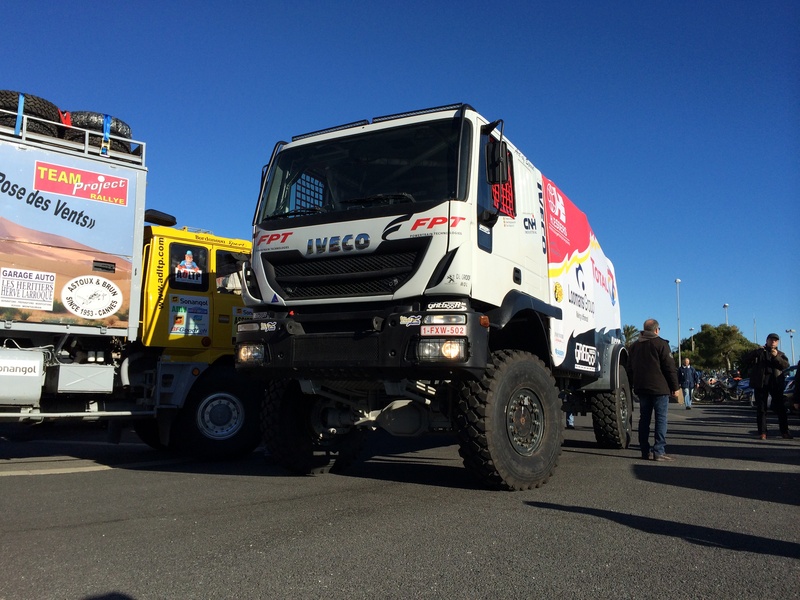 His Iveco Trakker generated quite a bit of interest when it arrived on the bed of the service truck. Missing from the scrutineering was Elisabete Jacinto, who joined the rally in Spain. We hear that she has made some modifications to her MAN since last year’s race, in particular so that she can drive with very low tire pressure in the dunes. We didn’t see her truck, so we don’t want to speculate what that might be. 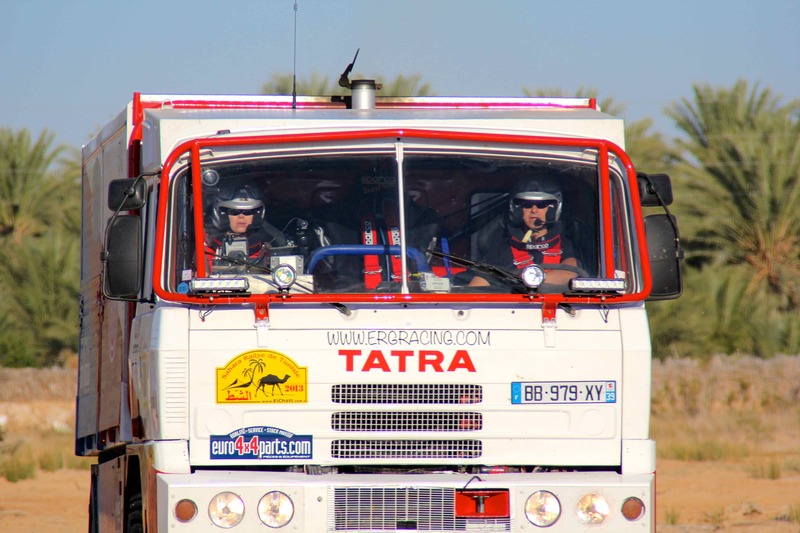 Stage 11 included the last Special of the rally, after which we’d head northeast to Sfax and then north to Hammamet for the prize ceremony at the Sultan Hotel. Just after breakfast, we checked the lobby where the organization was posting rally information. 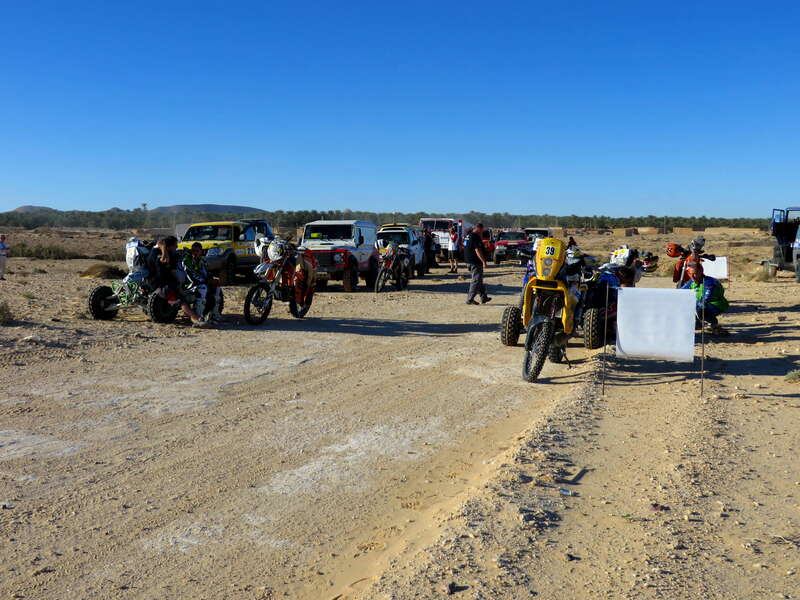 The Chott was dry, so the special stage would take us through the Chott to the finish line in the foothills of the small mountain range to the north. At the driver’s briefing, Jörg had reminded us that it was dangerous to leave the pist in the Chott, we could get seriously stuck, and the roadbook was clearly marked for about 20 kilometers, “Do not leave the pist.” We were a little worried. Sometimes it isn’t obvious where the “piste” is; the tracks sometimes diverge or become confusing. If we had a problem, it could be difficult to recover the truck. The piste was fast at the start of the stage, and we quickly came to the wide plain of the salt flat of Chott El Fejej. We were reassured to find that there was no ambiguity, the track was straight and clear. At first the sand was firm, but as we got further into the Chott, there were some areas where it became very soft and we could feel the wheels slipping and the engine working harder to drive us through. At several points, we could see the tracks of the cars that had already passed were becoming quite deep and we hoped we’d be able to make it through with only 2-wheel drive. With just a few kilometers to go, we reached a very soft area a few hundred meters long. We got just over halfway through when the front right wheel on the broken axle shaft started sinking down. 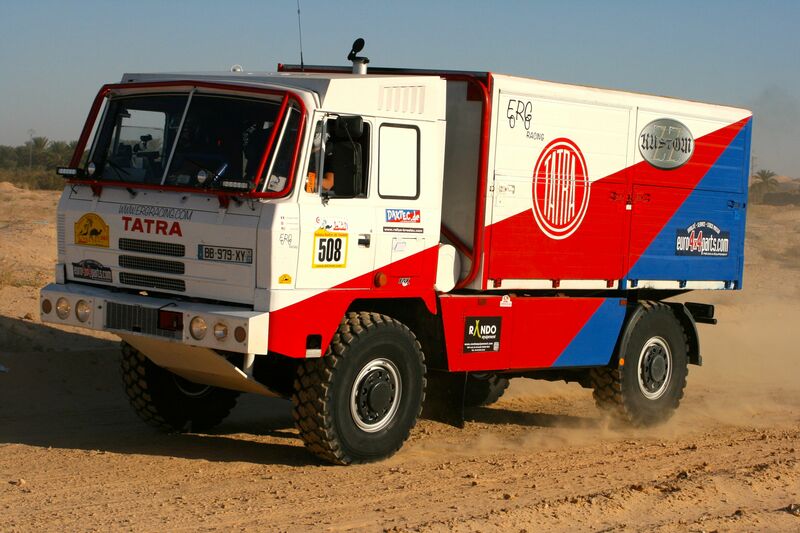 Very quickly, almost before we could react, the Tatra slowed to a stop, leaning sharply to the right. We slowly backed out of our tracks to try another trajetory to the left. During this time we were passed by several rally cars. The Unimog passed, but didn’t dare stop in this location to help us. There wouldn’t have been much they could have done anyway. We weren’t stuck, and didn’t need to shovel, but we had to move slowly to back out of our tracks enough to take another direction. We tried two or three times, but each time the sand was just too soft and we were starting think we might not get through at all. After a while, the MAN KAT trucks from the organization arrived and stopped just behind us. They weren’t sure they could cross either even without a broken axle shaft. One truck slowly passed through on the far left and made it, stopping just past the soft area at the foot of a small dune. We discussed with them, deflated our right front tire manually to the minimum pressure we could use and then tried the same spot. We got through, but we’d lost a lot of time and if we inflated our tire again manually, we’d have lost even more. We weren’t sure we could make the Stage finish in the maximum allowed driving time, but we were determine to do our best. Once we made it through the Chott, the piste at the foot of the mountains became rather technical and we had to cross several oueds where the track was quite dangerous because erosion on the shoulder had created deep crevices. The tracks were often stony and we weren’t comfortable driving too fast with our deflated tire. If we stopped to inflate it or had a flat, we certainly wouldn’t make the finish in time. Fortunately, the technical section wasn’t too long, and the piste was flat and fast on the last kilometers of the Special. We reached the finish late, but we made it! We stopped to inflate our tire before beginning the 200 km liaison to Hammamet. 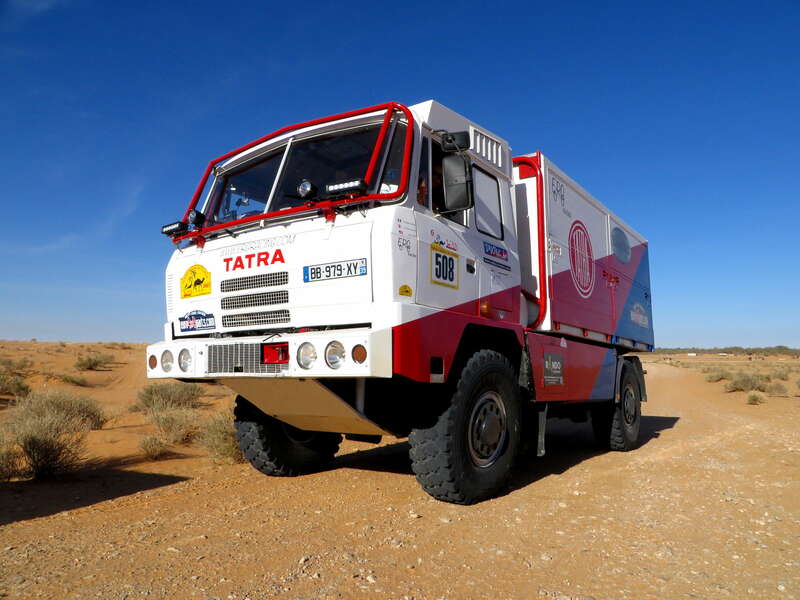 We arrived at the hotel after dark and quickly took care of the necessary maintenance for the Tatra, inspecting everything and cleaning out the water separator, which seemed cleaner than it had been on the previous days. We showered before going to the buffet dinner and settling in the meeting room where the prize ceremony would be held. The rally had been difficult, and we had done at least three-quarters of it with only 2-wheel drive. 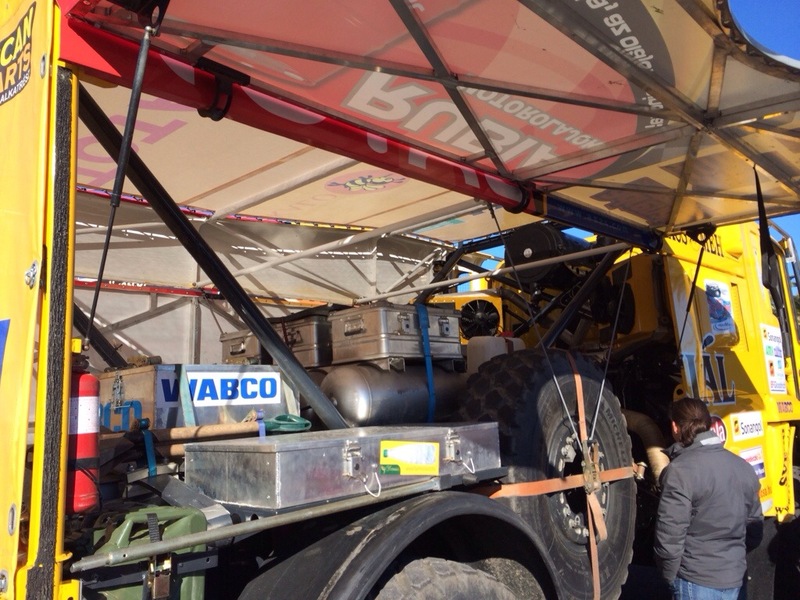 We had encountered a number of set-backs: the broken axle shaft, the fuel problem, and the departure of our mechanic. There were many occasions when we could have decided it was just too hard and given up, but we didn’t. We went to the starting line everyday. We had come to live up to the challenge and to learn so we were determined to do our best to finish, and we did! Along the way, we learned a lot, met some wonderful people and had a fabulous experience that we hope will allow us to improve our driving, navigation and overall performance for next year. Receiving the 2nd place trophy in the truck category was an unexpected reward for all our tribulations. On the ferry home while our experience was fresh, we made our wish list of modifications to the Tatra for the next rally. Last Friday we drove it to Kopřivnice where it will spend the winter during the upgrades and the repair of the broken axle shaft. 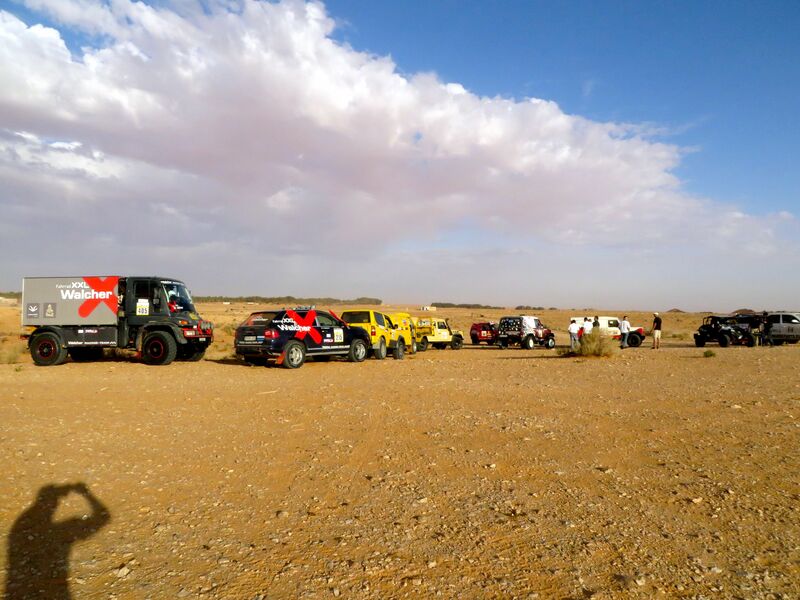 We said goodbye to Ksar Ghilane in Stage 10, which lead us back through the dunes by the Park Jebil along extremely fast tracks and through a complicated series of narrow paths to Kebili. We had a little trouble at the start. The day before had been quite windy, and the sand was much softer than when we arrived. 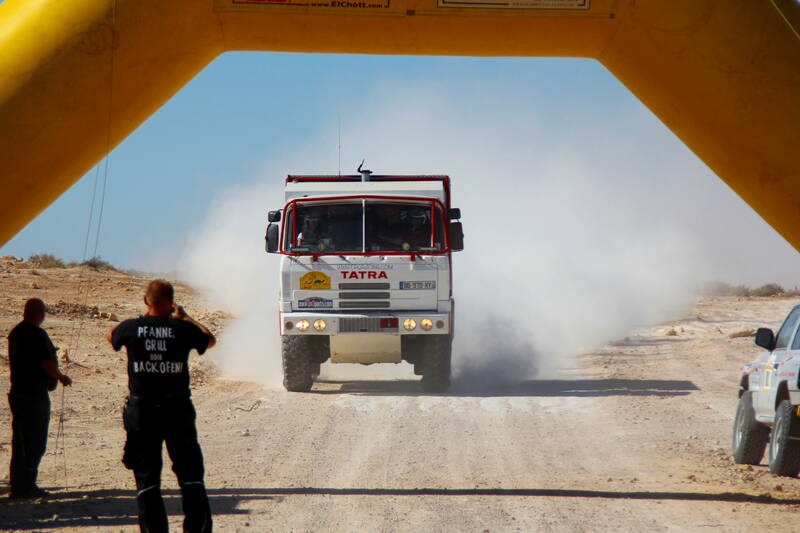 The rally cars that had driven the dunes in Stage 9 had a hard time because of the soft sand and limited visibility. Although the wind had died down and the visibility was good, the sand was still soft and we had to shovel for a few minutes just after the start, having been caught off-guard by this change in the terrain. That was the last of our problems. Once we got back underway, the stage went smoothly, even though we had to do it with only two-wheel drive. We were quite efficient, and didn’t lose any time, even when we had to cross some bigger dunes in the last dune section of the rally and on some technical passages with several difficult riverbed crossings. We drove very fast on the last section of the Stage, probably faster than we should have given our broken front axle shaft. When we arrived at the finish, the Explona guys, who had been tracking our progress, laughed and told us to drive a little more slowly on the short liaison to Kebili. We arrived at the lovely hotel Yadis Oasis in mid-afternoon and checked in before starting the evening’s routine maintenance and road book study. We had not experienced any engine problems during the day, but we cleaned the water separator, which was dirty again and for the last time this rally prepared the cockpit for the next morning’s departure. We had just enough time for a quick warm shower before the dinner buffet and driver’s briefing. Tomorrow’s stage would be short but interesting. If all went according to schedule, we’d cross the Chott El Fejej before heading into the foothills of the mountains to the north, along some winding tracks leading to the finish. In the morning, the organization would send an alpha car to make sure the Chott was dry enough to cross. Read the next post in the series or go back to the start. Stage 8 of the El Chott Rallye had promised to be fast, and we had hoped that with careful navigation and the absence of dunes, we’d move up in the rankings. It was another bright sunny morning and our spirits were up. We were happy to still be at the starting line of the rally. Just after the start, as we accelerated to full power on the rocky piste, the engine stalled. We pulled over to the side to let the competitors behind us pass in case they came along before we got started again, but we had a hard time restarting the engine. We engaged the auxilliary fuel pump, but each time the engine cranked again, it stalled as soon as we asked it for power. Decidedly something was very wrong, and we suspected a problem with the fuel line. 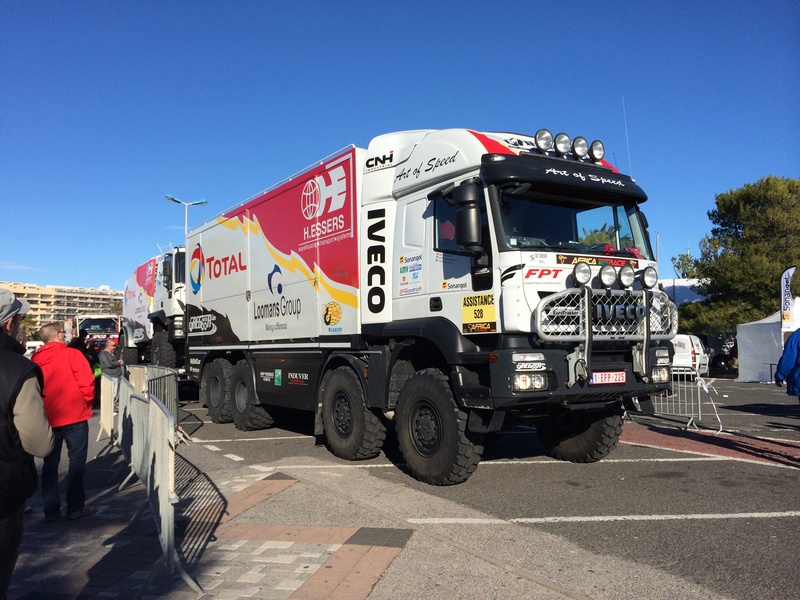 We had already changed the fuel filter, which didn’t seem especially dirty, so it seemed unlikely that the problem would be something we could fix quickly on the side of the road. We weren’t far from the start, so we headed back to camp to undertake a complete flush of the fuel system. It took the better part of the day to do something that the professional teams can probably do in a few hours at most, but it was just the two us since our mechanic blew a fuse and left the rally after we broke the front right axle shaft and had to spend two nights in the dunes during Stage 3. This was the first time we had to do this kind of maintenance and since taking apart the fuel line is critical, we took our time to avoid making mistakes. If we have to undertake this procedure again in the future, we’ll be much faster next time now that we know exactly what to do. During all this time, just beside us, one of the teams was changing the transmission on one of the Porsches. This provided a lot of cinema for the other rally participants and locals alike. After we ahd flushed all the lines with compressed air to clean out any blockages, we took the Tatra for a short test drive after dinner, but the problem persisted. There was no point in working all night since Stage 9 was almost entirely in the dunes, and we wouldn’t be able to drive it with our broken axle shaft anyway. We’d have the whole next day to continue our search to find and fix the problem. In the morning, we went to the starting line to take the minimum penalty and then went back to camp to continue working. We weren’t alone. Several other cars had left the starting line only to make a u-turn back to camp to make needed repairs. We had few choices left: an air issue, a problem with the water separator or something more sinister in the engine that we probably wouldn’t be able to fix. We were starting to worry that the issue might be serious enough not just to prevent us from finishing the rally, but to cause problems on the drive home. We started by opening the water separator. 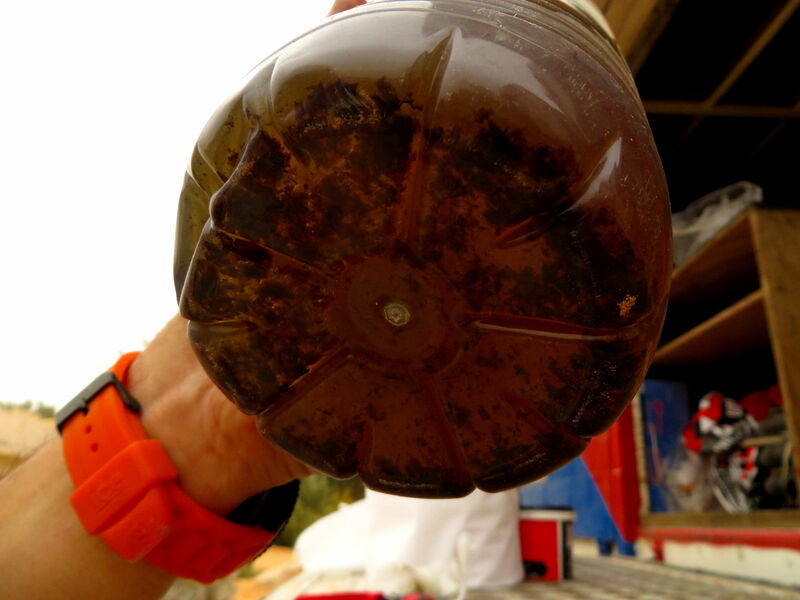 It was completely clogged with what looked like dirt. We had found the problem! We didn’t have a spare water separator so we rinsed it out several times with gas until it ran clear and then we flushed it with compressed air. As soon as we put it back together, we went for a test drive. We had full power again! The problem was solved: either we had gotten bad diesel when we had refuelled in Kebili before reaching Douz and the problem had taken a few days to show up, or somehow something had gotten into our fuel since the rest day at Douz. 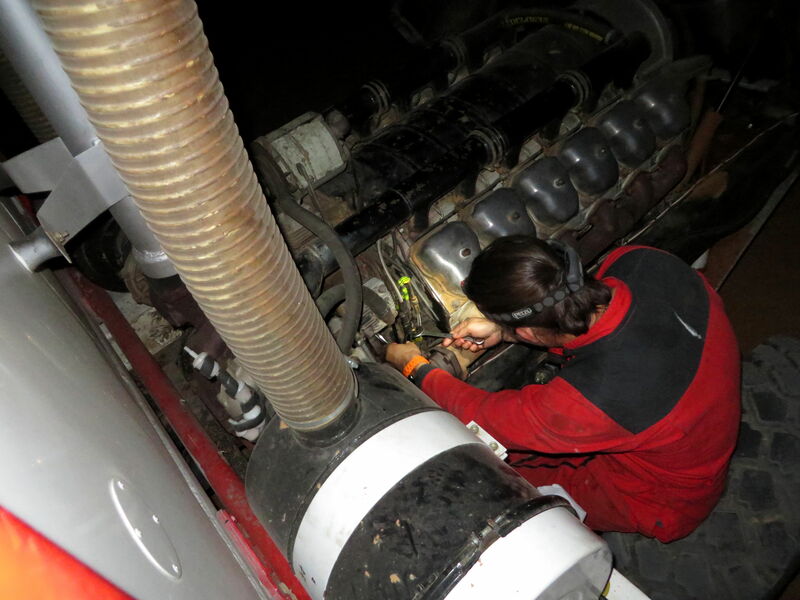 Unfortunately, we didn’t have the means to empty over 500 litres of diesel and clean the fuel tanks, so we’d have to clean out the filter every night and hope that would be sufficient. Relieved that we’d found the problem, we set about preparing for the next day’s stage, excited once more to be ready not only to start, but to complete the Stage. 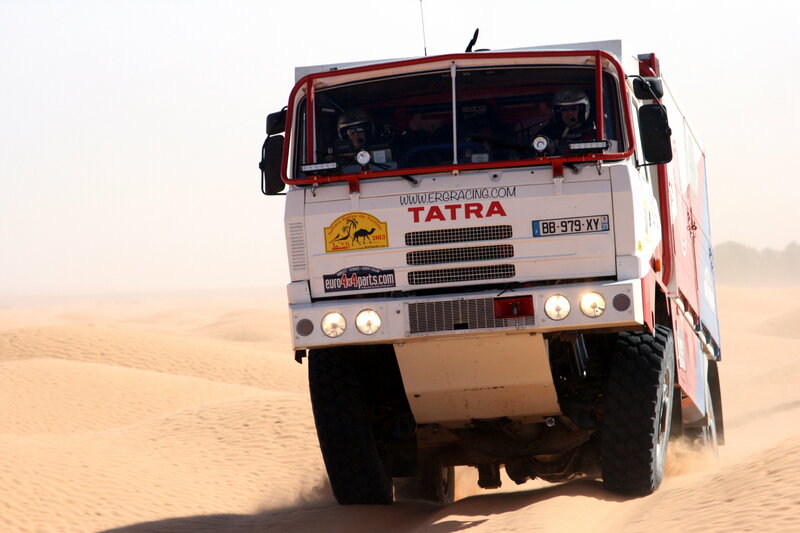 Stage 7 started in the Camel Stadium at Douz and took us back to Ksar Ghilane along stony tracks some of which were fast, but which were often covered by sandy dunes from the encroaching desert. 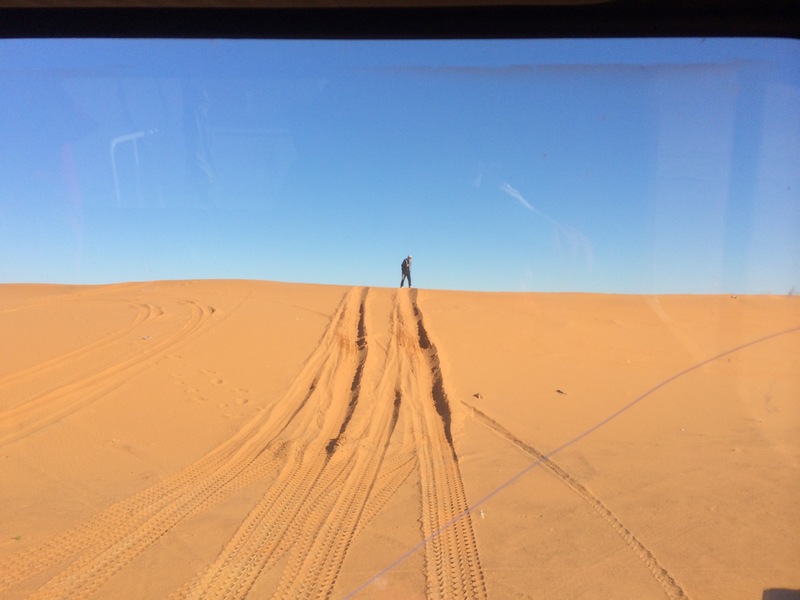 We had to leave the roadbook for a few kilometers to avoid a dune crossing that was too technical for us with our damaged axle shaft, but the piste was covered with sand in many places, and we had to find our way through some small dune fields around the Park Jebil. 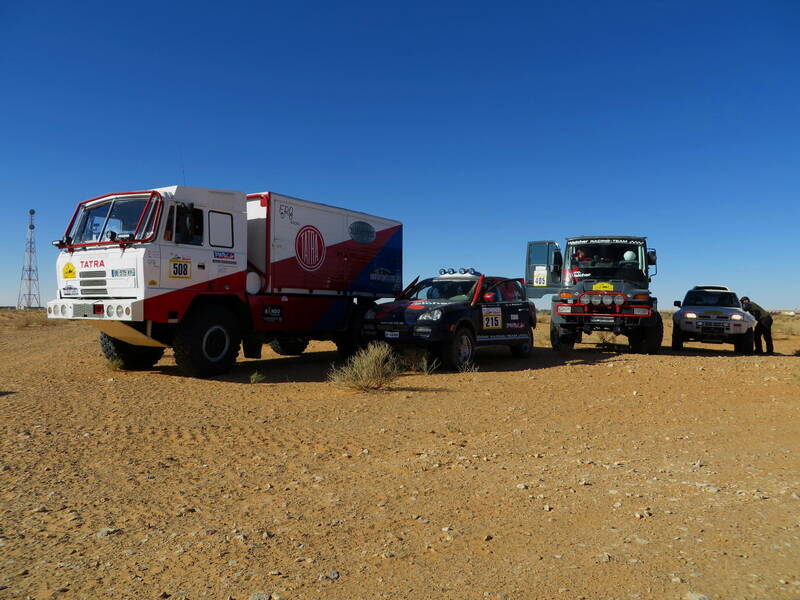 We arrived at the finish in Ksar Ghilane in the second part of the afternoon in the late autumn sunshine. Despite the detour around the dunes, it had been a good day. We had driven as fast as we dared on the piste, but a few times the engine had lost power. 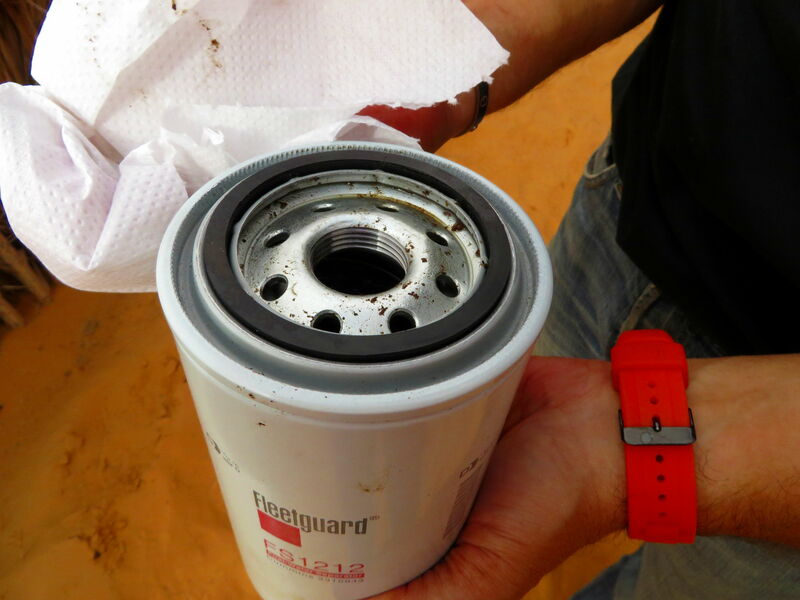 When we got to camp, we made another general inspection and took a close look at the fuel filter. It didn’t seem too dirty, but we decided to change it anyway just in case, hoping that would fix the problem. 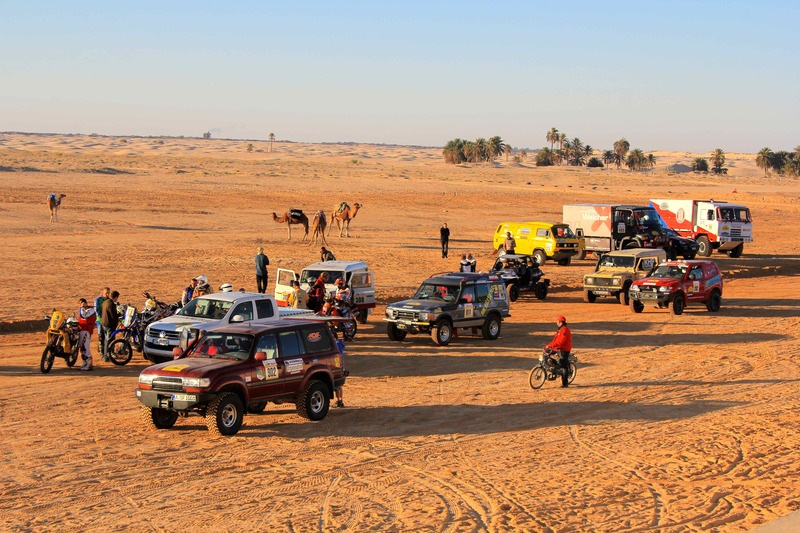 In hindsight, we should have done more tests, but we were tired, so we spent the rest of the afternoon getting settled in at the camp, where we’d stay for the next three nights and preparing for the next day’s stage, which was perfect for us since there were no dunes. We hoped to drive well to move up in the rankings. At the driver’s briefing after dinner, the organization announced a number of changes to the roadbook because of road construction along the track, and we dutifully took note of the new directions. We went to sleep early to be well-rested for the coming day, but we didn’t suspect what lay ahead. We were back in the rally at the start of Stage 6, but we couldn’t drive very fast to avoid further damage to our broken axle shaft. Without the front right wheel drive, we also had to avoid the high dune sections, taking the associated penalities. The piste was very fast, but it was covered with sand in many places, and the small hard dunes were quite effective “speed bumps.” We crossed a rather sparse dune field as the route led us farther south to Bir Aouine. 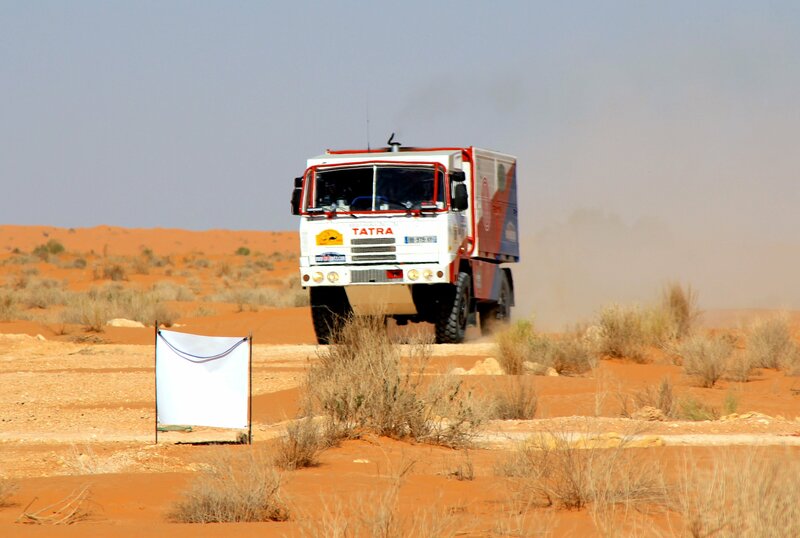 From there, the road book indicated a short but difficult dune crossing, which we couldn’t attempt with our broken axle shaft, so we went around it, navigating by cap to pick up the road book on the other side. Despite all the handicaps, we drove well, but we had to take the CP Exit at Ksar Ghilane because the road book led to Douz by way of the dunes. We took the road instead. All of this was too much for our mechanic, who couldn’t take any more and decided to leave the rally when we arrived in Douz, so from there on, it was just the two of us. The following day, the rally had scheduled a “rest day” in Douz. We had a break in driving, but it would be a mistake to think we actually got much rest. 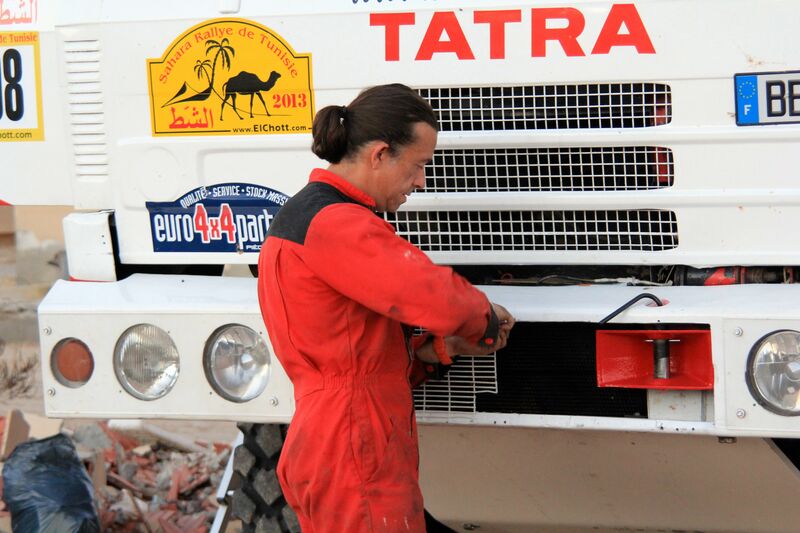 In fact, we spent the better part of the day doing maintenance and making some minor repairs after 5 days of hard driving in the sands of Tunisia. It wasn’t difficult, but since our mechanic had left and there were just two of us to do everything, it took somewhat longer than it would have for a trained professional. We made an overall inspection, paying careful attention to the broken axle shaft to make sure it wasn’t leaking anywhere. We checked the oil in the gearbox, transfer case and axles, cleaned out the air filters and cleaned and greased all the working parts. We also repaired the front grill, which had been broken in the dunes, to protect the radiator from damage by a flying stone for example. We were lucky we didn’t have anything more serious to deal with, and at the end of the day, we made all the usual preparations for the next day’s stage: preparing the roadbook, filling up the Camelbaks with drinking water, checking all the navigation instruments and packing our “fast food” lunch boxes.